Francine has always been told that she has to be “itty bitty” to rope, ride, and chase cans. But Flitter the horse, her new best friend, tells her she’s “Workin’ Stock” like him. She’s made to do more than just look pretty and just like him, she can be fast. Ol’ Merle, the ranch’s number one guard dog, tells Francine only skinny girls and horses can win in the rodeo arena. She takes a chance and tells him she and Flitter will barrel race in the back corral to prove him wrong. If they run a slow time, they’ll only prove Merle right. Can Francine and Flitter, the Workin’ Stock Cowgirl and Quarter Horse, really run fast fast fast and beat the stopwatch? 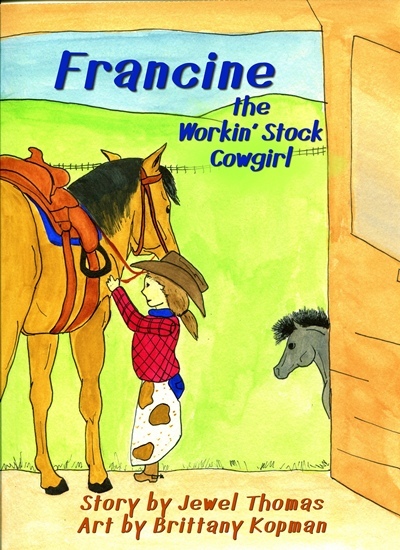 FRANCINE THE WORKIN’ STOCK COWGIRL is a fun and inspiring picture book about a girl and her horse who don’t fit the stereotype for barrel racing. The positive lesson in body confidence is one young girls will remember all their lives… in or out of the arena!